Originally posted: December 6, 2017 . Last modified: March 17, 2019 . 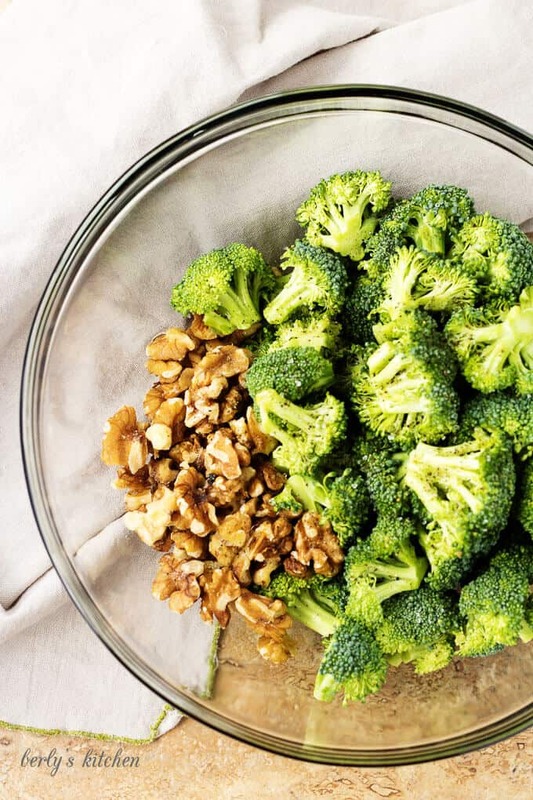 Oven Roasted Broccoli with walnuts is a quick and healthy side dish that everyone will love. It’s crunchy, nutty and takes less than 20 minutes to make! I can’t tell you how many times I’ve heard someone ask, can you oven roast broccoli? 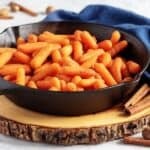 The short answer is yes, but there are a few things to keep in mind when making our side dish. 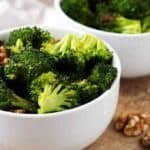 Oven temperature, cooking time, and choosing the right oil are the key factors to a great oven roasted broccoli recipe. As you will see in the photos, we chose a high-quality olive oil for our roasted broccoli. Additionally, Kim cooked them at 425 degrees F., the perfect roasting temp. She only let them cook for 8 to 10 minutes, any longer and the walnuts would burn. Next, wash, dry, and cut your broccoli into bite-sized pieces. Then, in a mixing bowl, combine the broccoli, oil, and walnuts. Toss everything together. Last, put the pan in the oven for 8 to 10 minutes or until the florets begin to brown. Don’t overcook the dish! Serve while hot and add salt and pepper to taste. Be sure to dry the broccoli completely or it will steam, not roast. If the dish cooks too long, the walnuts will burn. Consider adding red pepper flakes for a little kick of spice. Grated parmesan as a topping adds another layer of flavor to our oven roasted broccoli. Side dish recipes like broccoli, Brussels sprouts, and salads are great options to have on-hand. 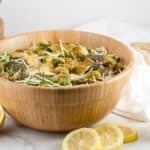 Kim and I invite you to try our oven roasted broccoli and see for yourself that healthy can be delicious! 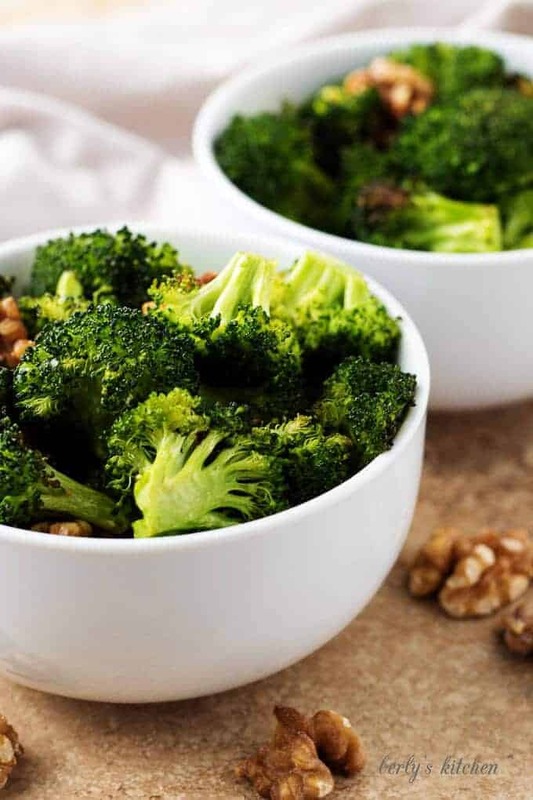 Oven Roasted Broccoli with walnuts is a quick and healthy side dish that everyone will love. It's crunchy, nutty and takes less than 20 minutes to make! First, preheat oven to 425 degrees. Next, wash and dry broccoli florets. 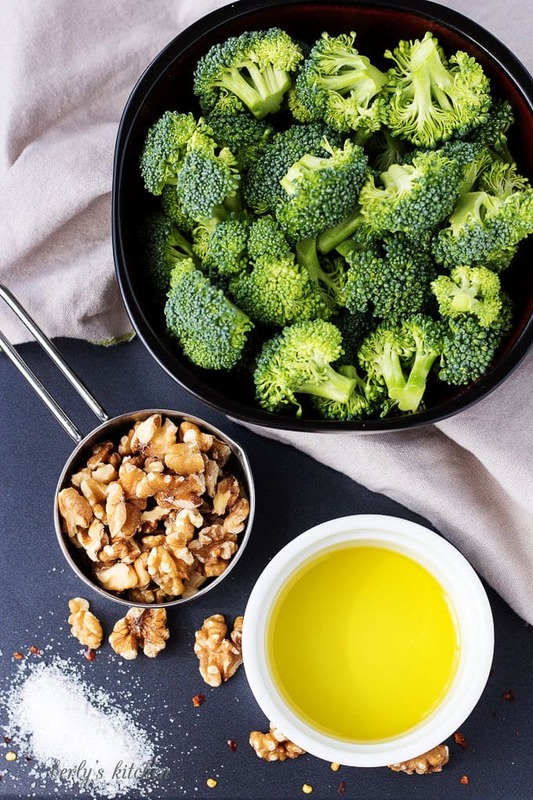 Then, place broccoli, walnuts, and olive oil in a large mixing bowl and toss the ingredients together. Afterward, pour the broccoli mixture on a baking sheet and place in a preheated oven. Last, bake for 8-10 minutes or until broccoli tops begin to brown. 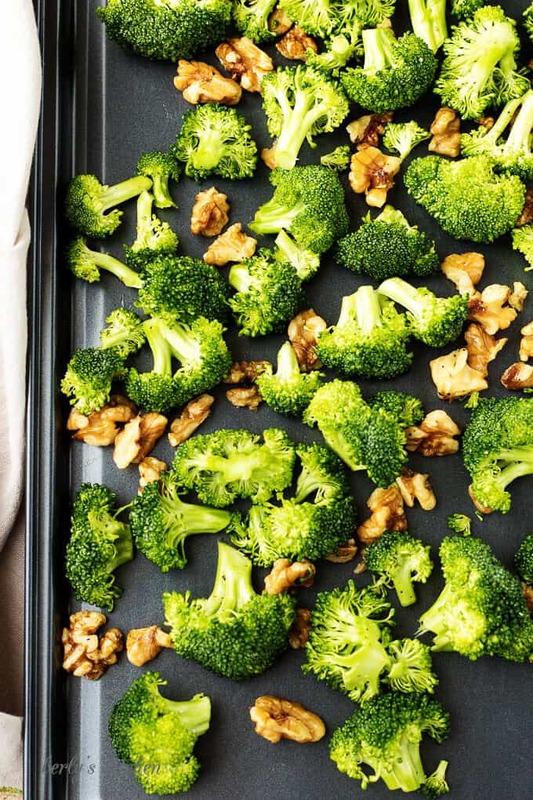 Remove the roasted broccoli from the oven and serve while hot. The calories listed are an approximation based on the ingredients and a serving size of one cup. Actual calories will vary if substitutions are made. Roasted broccoli can be stored in your fridge in a sealed container for up to two days. Yummy!!! this looks so stinking good, I need to try making this. Thank you, Isabella! I am glad you liked the broccoli! Yum! I love both of these but never thought to combine them! This looks so tasty! I love broccoli, especially for a quick snack or fast lunch during the day while I’m working from home. Great combo of flavors here! This looks delicious. I get so tired of steamed broccoli, but I’m usually at a loss as to what to do instead. I’m really looking forward to trying this recipe soon. So simple AND delicious! 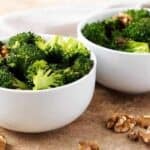 I love the double whammy of health benefits from broccoli and walnuts in this dish. Nice! So fresh and easy! Pinning for later. YUM. This looks sooo good! I love broccoli so I definitely need to try this out! Yum! I love broccoli, especially in stir fry or salad. I will have to try this out, it looks delicious! I LOVE roasted broccoli, especially when it gets a little charred on the edges. And good idea to add some walnuts for crunch! My favorite way to eat veggies is when they are roasted! I haven’t tried any fun new recipes with broccoli yet, so I’ll definitely have to give this a try. Thanks for sharing! 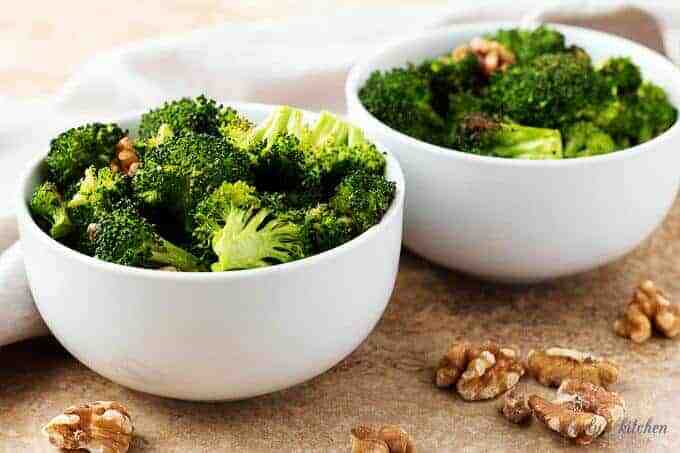 I love broccoli and I love walnuts! This is the perfect combination. I can’t wait to try it! Thank you, Diana! I am glad you like the recipe 🙂 Have a great day! Oh my gosh, this looks so good! I’m definitely going to try this. Roasted vegetables are the best! I especially love roasted broccoli, I could eat it as the main dish.